It is possible that sugar prices bottomed over this and the last trading session. The sugar trading entry I've been waiting for is, I suspect, upon me. I have gone long sugar at 19.88 at 10:56 (my time). This was a tricky trade to enter. As a result of some fundamental data I've been looking at, I feel as though a very sudden change in sentiment could occur in this market. The MACD divergences demonstrated below are not quite complete, but I felt as though I had to take the opportunity to enter the trade anyways. Observe the following daily chart for the March sugar futures contract. You can see here that prices have gone into the vicinity of the latest low produced about two weeks ago. MACD has been rising nicely, indicating a potential change in trend. What I am hoping to see is a repeat of the last MACD divergence type situation that occurred in the area circled in green. This is not a perfect MACD divergence, and may still complete itself or it may not. To find a suitable entry point in this market, a closer look using 60 minute futures trading charts is helpful. Observe the following 60 minute time frame futures chart for the March contract of sugar futures. 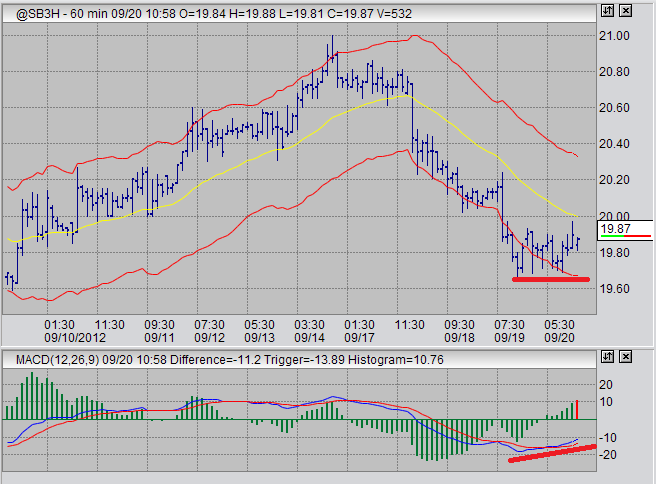 We can see here the MACD divergence that has been produced. 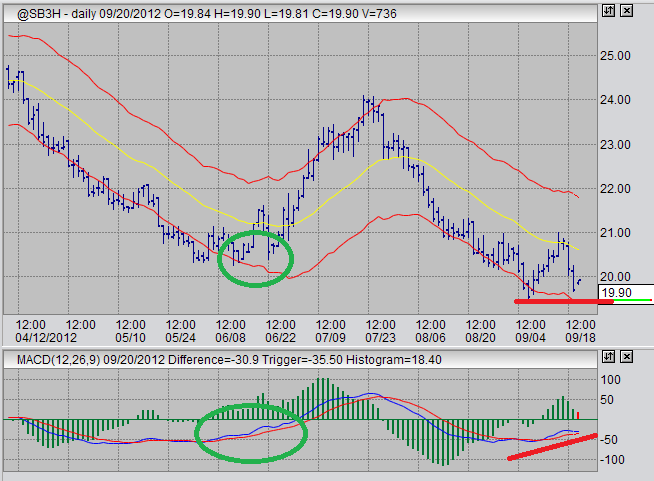 Again, as with the daily chart, this is not a perfect MACD divergence, and it may still complete itself. However, I felt that the time to enter was now, so I did. This, in combination with the current state of the dailly chart, was my cue to enter the long position I've been waiting for. I'll be using a loose stop for this trade, as I am of the mind that this signal could produce a larger upward dynamic and I do not want to get stopped out prematurely. If the trade begins to move in my favour and I haven't gotten stopped out, my bias will be to hold this trade and keep my long position open until I start seeing signals to exit. I will also be trailing my stop.